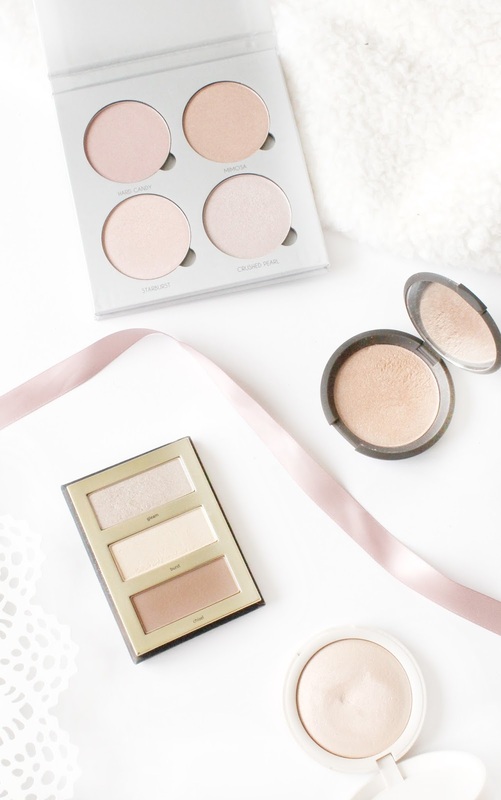 Over the past few months highlighter has become an everyday go to for me, as it just adds a little something to an everyday makeup look and let's be honest, who doesn't want to feel like a unicorn everyday with a little extra sparkle. I thought i'd share a few favourites of mine, of which i'm sure you'll all love just as much as I do! This time last year highlighter was something or a rarity and was something i'd save for a night out, but fast forward a year later to where I now can't not leave the house without wearing it! With that comes expanding my highlighter collection and it's safe to say I have a few favourites that I couldn't not share with you. One of my very first highlighters was the Topshop Highlighter (£12) and is one that I still love to this day, but of course I have repurchased since my very first one! I love this highlighter for an everyday highlighter as it is quite subtle, but can build up to a lovely highlight that just glows all day long! I really like the formula of the topshop highlighters and they offer a really nice range of shades so you're bound to find one you like! A palette favourite of mine has got to be the Anastasia Beverly Hills Gleam Glow Kit (£39), which for me made me fall back in love with highlighters as this palette is so pretty. It has a lovely range of shades, some of which double up as a blush for me as my skin is quite pale, but my favourite shade has got to be Stardust as it is the perfect highlight shade to really make your skin glow! Unfortunately this palette has been discontinued but they have recently released some new palettes of which I am drooling over just looking at them, so i'm sure once of those will be perfect for you. A couple of recent additions to my collection that I recently picked up in Australia have been my absolute go to's recently, as i'm sure you know as i've featured them quite a lot lately. The Tarte Pro Glow To Go Palette (£20) is an easy use and on the go palette that is great for both highlighting and contouring. This palette has two beautiful highlight shades, of which I like to mix together to give a beautiful yet luminous glow. Another favourite that is literally the most beautiful highlight that i've ever set eyes on is the Becca Champagne Pop Shimmering Skin Perfector (£32) which as the name would suggest gives a beautiful champagne highlight pop to the cheeks that I just love!